Industry 4.0 is aimed at increasing production capacity and improving efficiency through the linking and optimization of manufacturing-related elements, the objective of which is to enhance enterprise profitability and competitiveness. Under the Industry 4.0 concept, factories can optimize many of their projects, such as the collection of equipment information, reduction of manual intervention, control over production processes, and planning of production schedules. To implement such optimization measures incrementally, factories must organize their equipment and IT management layers in such a manner that they are connected in series. However, these two layers effectively operate as independent systems. The only approach through which both systems can be integrated is to use an IoT platform to serve as a bridge for uploading low-level equipment data to the management system and for the upper IT management system to control the low-level equipment. 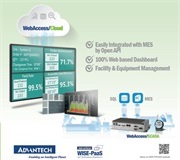 As a VIP member of Advantech’s WISE-PaaS Alliance, CYAN Intelligent has utilized Advantech's WebAccess/SCADA IoT platform and related hardware products to successfully integrate the equipment and IT management layers of a PCB factory. 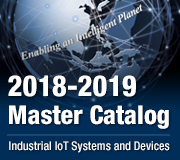 The functionality and open development environment of Advantech’s WebAccess/SCADA solution has ensured that CYAN Intelligent can collect equipment information from production lines and import production records into the factory’s current manufacturing execution system (MES). The company also designed a foolproof mechanism to minimize human error. Furthermore, production history records can be used as a reference for future process optimization. 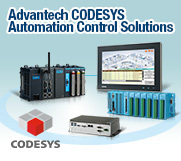 CYAN Intelligent is a system integrator that provides a wide range of SCADA systems. Its customized monitoring/control solutions have been adopted by government agencies, academic institutions, medical centers, and businesses in traditional printing and high-tech industries. At present, the company is planning to implement a monitoring/control system for a PCB factory in Taiwan. The factory specializes in the manufacturing of dedicated PCBs for high-end computers, and its production items must be adjusted frequently to meet high-variety low-volume manufacturing orders. Therefore, quality control is an ongoing challenge. For example, PCB baking operations are manually controlled by a production line operator, who follows a work order. Temperature problems from incorrect oven settings or an oven door being accidentally opened during baking can be difficult to notice and may result in low-quality PCBs. To address these problems, CYAN Intelligent implemented a system that enabled the monitoring of hot circulation ovens by linking the equipment and IT management layers together. The monitoring/control system was configured so that staff could simply scan the barcode of each work order; this triggers the MES to send the production parameter data directly to the oven, thus eliminating the need for production staff to control the oven. Data from the baking process are now recorded, and a warning is automatically sent when the oven temperature is abnormal or if the oven door is opened during baking. In accordance with CYAN Intelligent’s plan, the monitoring/control system for optimizing the baking process required a highly integrated IoT platform. The platform had to have a sufficiently open hardware/software design for it to successfully bridge the upper and lower layers, while offering easy-to-use development tools for designers to easily create user interfaces and develop the functions they need. The monitoring/control system also needed to be set up so that it could be used to configure hardware (e.g., industrial PCs [IPCs], data converters, and I/O modules). On the equipment layer, data are collected from the thermostat via RS-485 to Ethernet with the EKI-1222 gateway, which connects via TCP/IP to the IPC-7132 industrial computer. The IPC is also connected via TCP/IP to the ADAM-6200 series modules for oven control, and via USB to a barcode scanner for inputting work orders. WebAccess/SCADA software, which is installed on the IPC, stores the data on an SQL Server database and can also communicate with the management system on the IT management layer for importing production data into the MES and obtaining work order parameters from the MES and then sending to the underlying equipment. 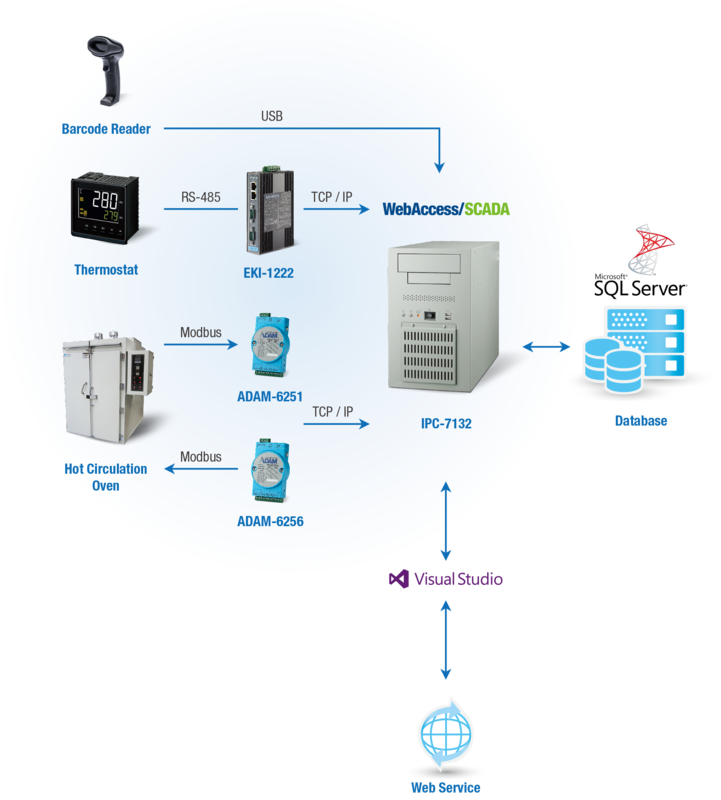 WebAccess/SCADA is browser-based SCADA software. Its GUI builder and selection of programming languages (TclScript was used in this case) enabled project designers to quickly complete the development of user interfaces, temperature trend charts, anomaly alerts, foolproof functions, and so one. Additionally, its open interfaces (e.g., ODBC, Visual Studio, and Web Services) made it easy to integrate data across systems. Regardless of whether it is low-level device data or production parameters on the management layer, all data can be freely circulated within the system. For versatility in system configuration, there are several versions of WebAccess/SCADA that come with different I/O tags. System planners can choose the appropriate version according to their data acquisition needs. Should expansion be necessary, the number of I/O tags can be increased to expand the scope of monitoring. WebAccess/SCADA’s free support of 1024 clients not only allows multiple users to simultaneously monitor production lines, but it also minimizes licensing fees. Regarding the hardware setup, the IPC-7132 was placed beside the 11 hot circulation ovens. Because it is an industrial-grade computer, it can withstand the high temperature and humidity of the PCB factory. Its multiple I/O interfaces provide easy connectivity to peripherals and networks. The EKI-1222 converts serial signals to Ethernet to allow data transmission via TCP/IP. The isolated ADAM-6200 series I/O modules have superior anti-interference features and provide user-defined functions that give designers flexibility for Modbus address configuration. Achieving Industry 4.0 first requires addressing the problem of cross-platform interoperability. 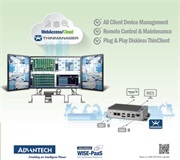 Advantech's WebAccess/SCADA solution utilizes an IoT platform to seamlessly integrate heterogeneous systems, and the company provides industrial-grade hardware for monitoring and data acquisition. This complete solution means that system developers do not need to develop their own drivers or worry about data conversion or hardware/software compatibility. This allows them to put more effort into monitoring/control system development to ensure that the needs of end users are met. 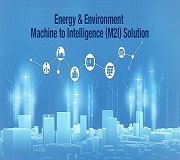 CYAN Intelligent is highly satisfied with Advantech’s PCB baking operation monitoring/control system, which was realized by combining Advantech's powerful WebAccess/SCADA solution with the highly skilled development capabilities of CYAN Intelligent. Currently, the monitoring/control system has been applied in two PCB factories. To implement more monitoring/control functions in the production line in order to optimize its manufacturing processes, the factory discussed in this article is planning to expand the scope of monitoring by adding extra WebAccess I/O tags.